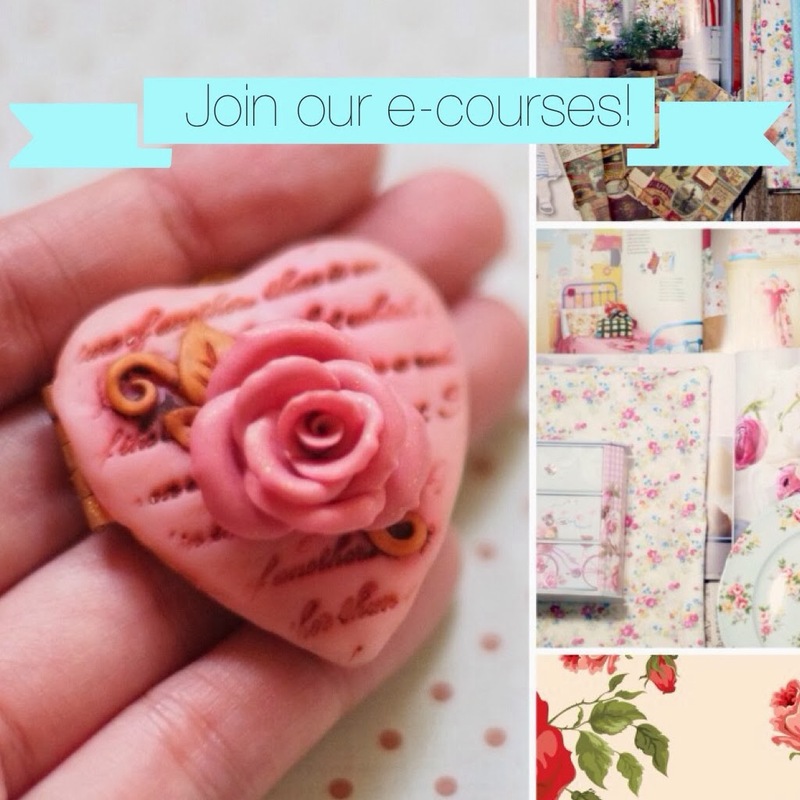 A picnic, a tea party, an afternoon of all things sweet and cuddly. Though yesterday afternoon was a bit dreary because of the rain, I had so much fun taking photos of my new collection! There was no real picnic nor tea party outside these photos, but there was definitely a lot of sweet nothings and cuddling going around. 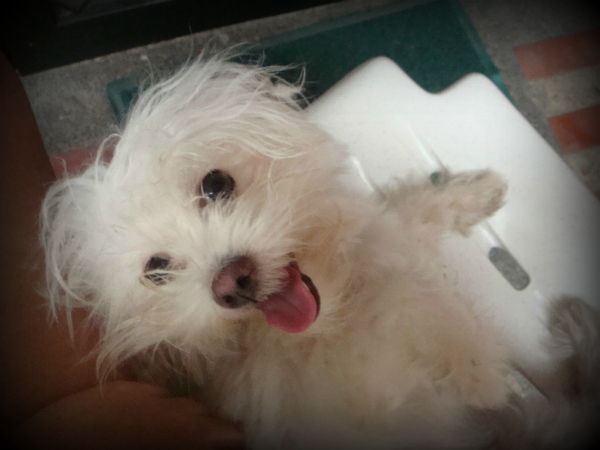 That's because this little one kept me company. 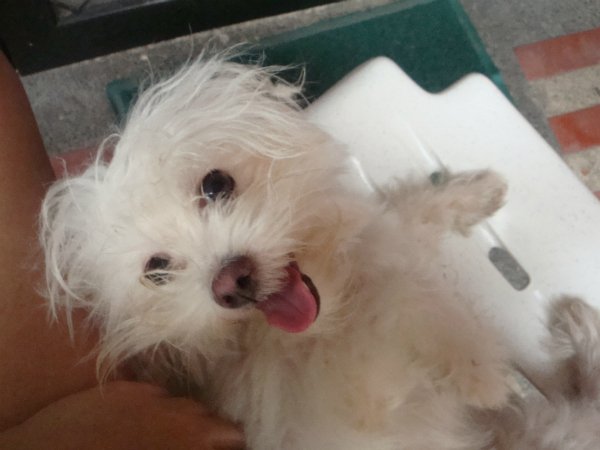 That's my little Izzy. Isn't she adorable? Hihi. Ok, back to the new stuff. The past few weeks, I've been making the tiniest cookies, donuts, and chocolate truffles. All those sinful stuff sweet-tooths like me go crazy over. So I spent the whole Sunday afternoon doing a "shoot" on my mom's porch. Just me, Izzy, a point-and-shoot camera, and the cutest miniature props ever. A huge chunk of my time was spent wishing: I wish I had more props. And I wish I were a better stylist and photographer. And more importantly: I wish that the goodies were edible. After drooling and day dreaming, I spent the rest of the afternoon choosing photos to upload to my various websites. Buying local (Philippines)? 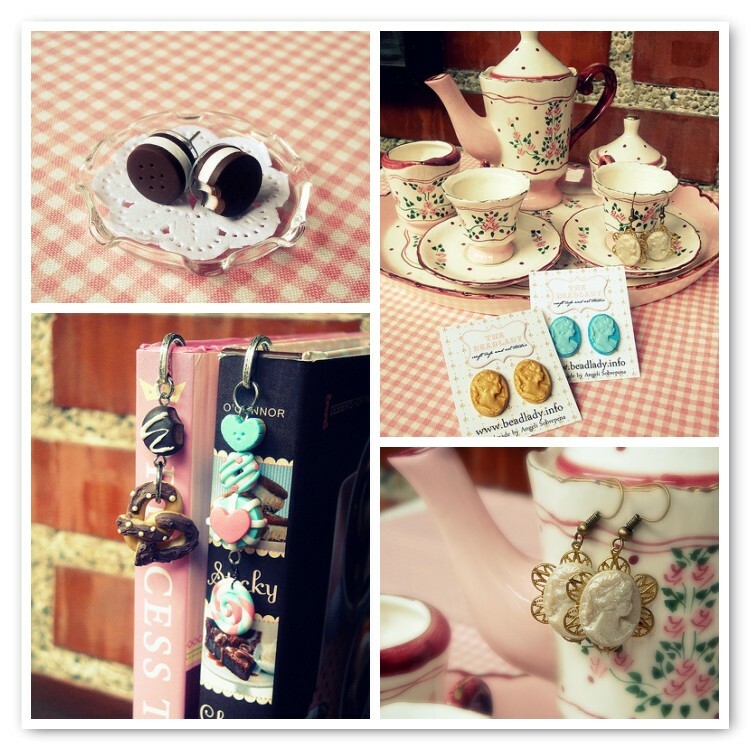 Do check out www.yummytrinkets.com. 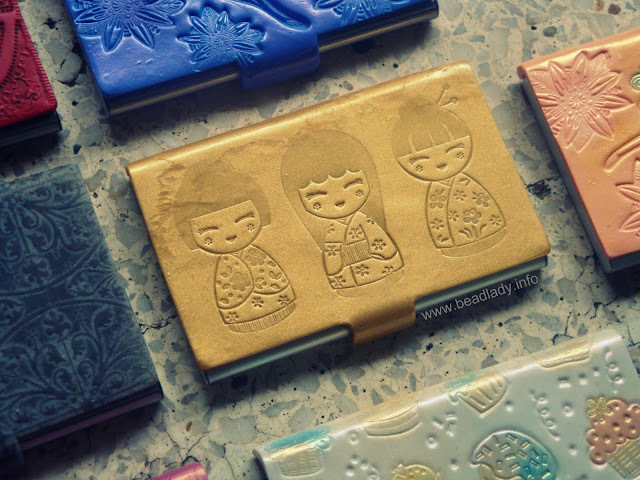 I made 10 handmade polymer clay-covered card holders in June, and now I can safely upload the photos (these were given as gifts by my customer, so I had to be hush-hush about it last month). 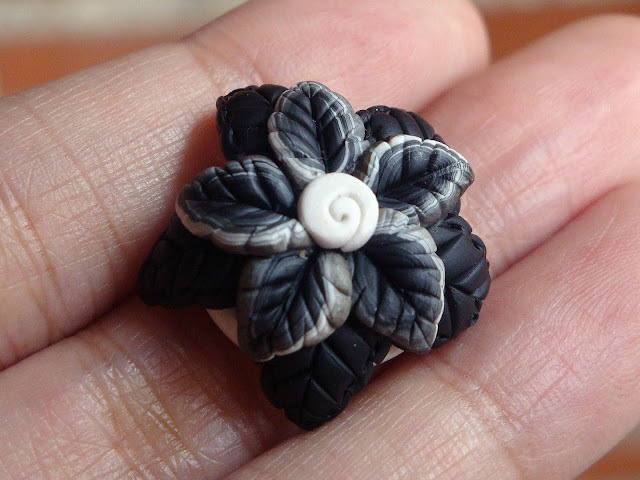 Our first swap/challenge at the Philippine Polymer Clay Guild involved creating 17 beads out of only black and white clay. You can make any size, shape, and style of bead you want - they just had to be all black and white. I thought the challenge sounded simple enough, but I was sooo wrong! There were so many possibilities, so many designs swimming in my head, that it was getting too complicated. My almost-automatic reaction was to make a black and white millifiore bead, but I already tried that before when I was a teenager. 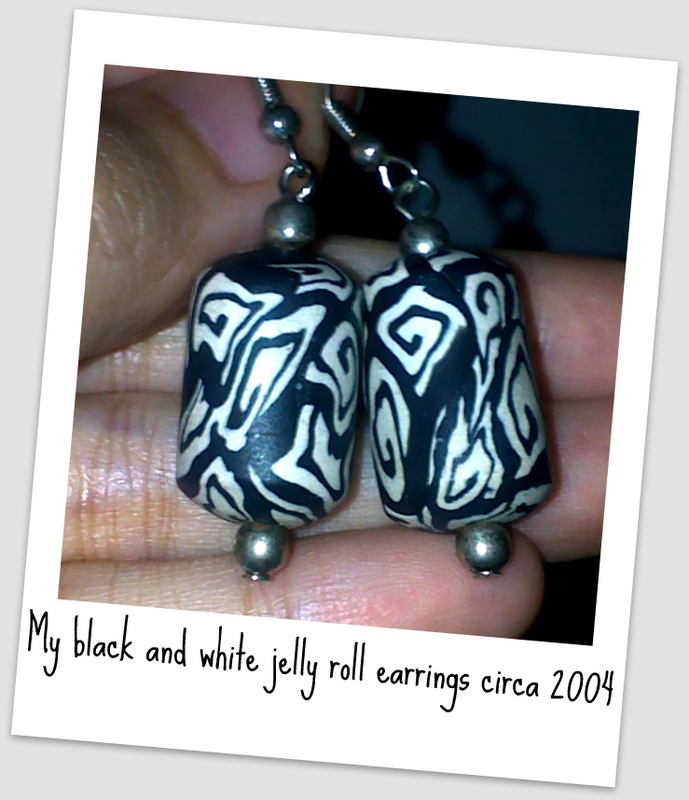 I made a black and white jelly roll cane, and turned the beads into ethnic-looking earrings. 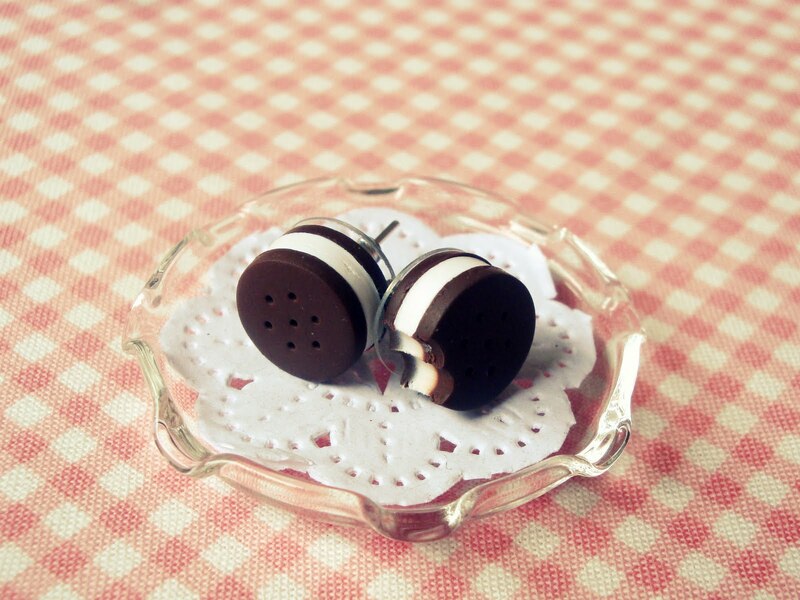 They are now one of my mom's most oft used pairs (photo above). For this P3 swap, I wanted to challenge myself to try something new, so in the end, I decided on this flower bead below. It's a variation of the Feuille de Autumne beads I made a few weeks back - a swirl bead as base, with two layers of textured leaves to form a flower, and topped with a smaller swirl in the center. But I realized I didn't have the energy to make 16 more of this bead. I am not a patient bead maker, in the sense that I rarely make multiple beads of the same design. I get bored easily, so I usually make just one or two identical beads, then move on to a different project. This challenge was a test of endurance and patience for me. Especially now that I get tired easily. Hindi kaya ng powers ko. So I had to simplify the flower bead into something more practical, but still charming and still represent me. The original plan with the flower bead was to add interest through texture and layers. This time, I wanted to focus on contrast. I was toying with the idea of doing black image transfers onto white clay, but trashed it because I couldn't find an image I wanted to use. At the very last minute, I finally found a variation I could live with. 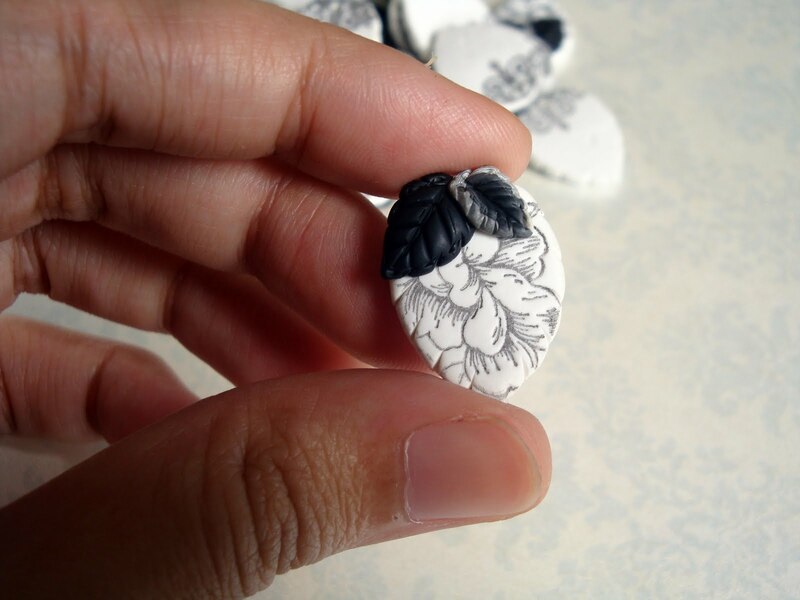 I used the textured leaf element from the flower bead, and combined that with the image transfer idea, and came up with my Toile de Jouy leaf beads. Don't they remind you of toile fabric? The smaller black and gray leaves were individually sculpted by hand. 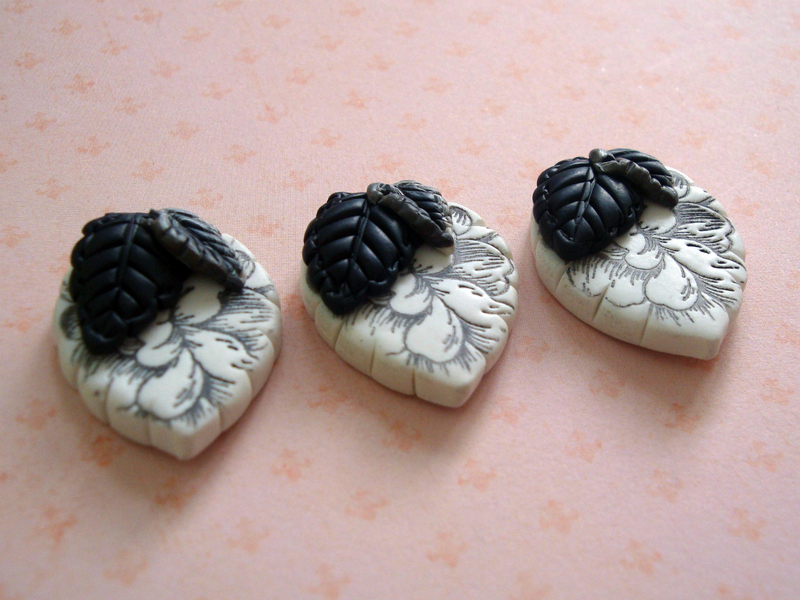 They're teeny tiny, so I had to work on them in the afternoons when the light was good. The larger white leaf were measured using a teardrop cutter for uniformity, then pinched and sculpted by hand to give it a more leaf-like shape. The image was then hand stamped. 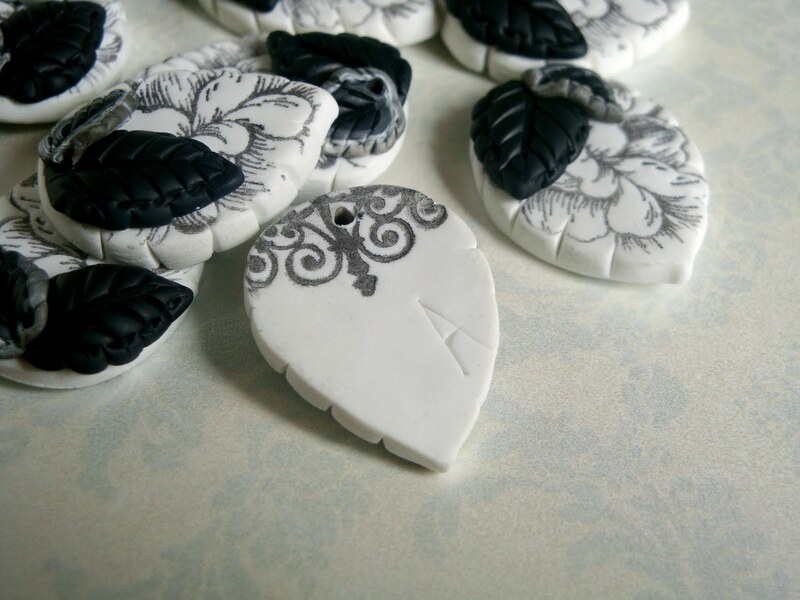 I wanted to add a surprising detail to the back of the beads, so I stamped another detail on the rounded corners. These beads are top-drilled, so they can be used as a charm, or added to wire-wrapped projects. 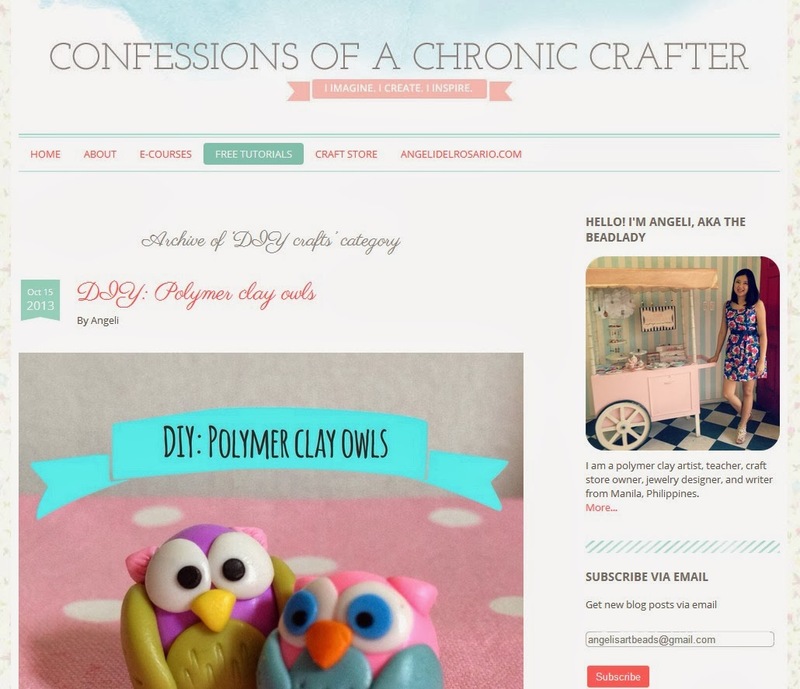 I've known this for a long time, but I am stressing it again: it's hard to keep white clay white, ugh. But with practice, I can now make clean, unmuddied white beads. Yay. 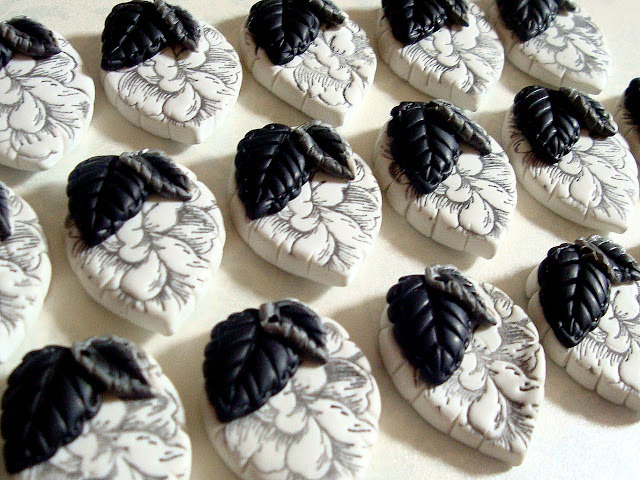 My eyes can't keep up with me anymore - I can't work with black clay at night. Now I know I was just suffering from tamaditis. I was just too lazy to do production work. 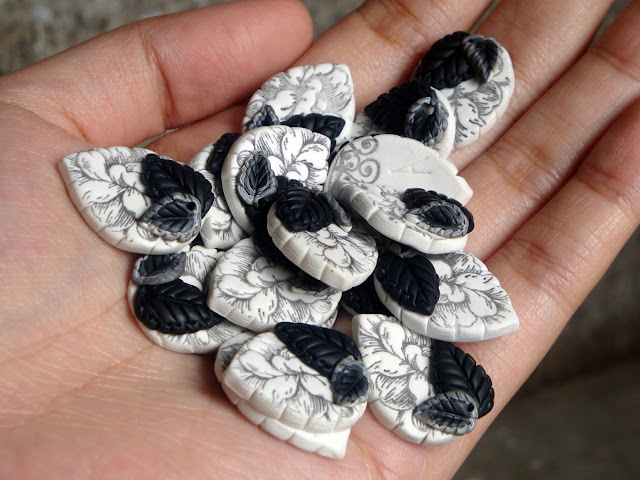 Thanks to this challenge, I'm now ready to start making identical beads in larger numbers - yey! 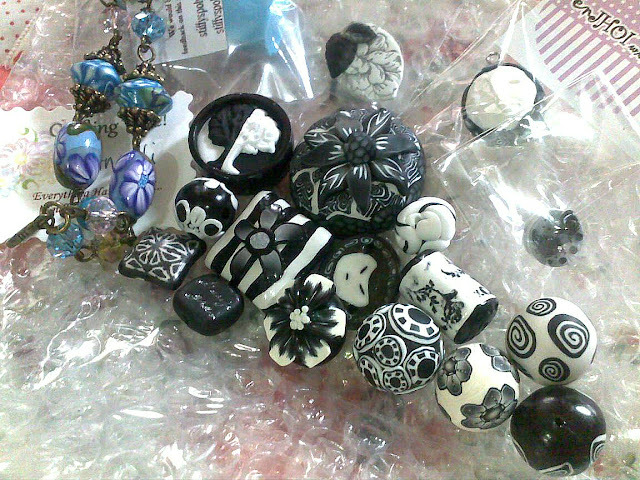 Today Mr. Mailman came and brought me the swap beads from my guild-mates! Woohoo! Here's my loot from the swap, plus a few extra goodies from generous members. Aren't they all lovely? 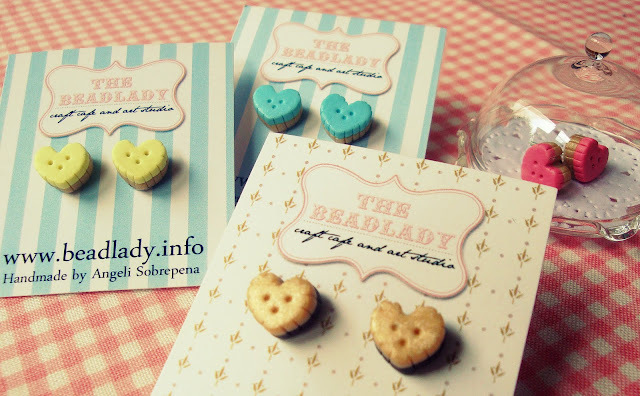 Check out more pics of these beads on our FB fan page!